Being in a choir is brilliant. Not just because you get to sing yourself happy in public without getting strange looks from other people (although that is a huge benefit for someone like me who has to bite their lip not to sing when at bus stops, on tube carriages and walking down the street). Singing is awesome because it brings so many benefits in a world that can sometime feel a bit 'doom and gloom'. Singing is the hug from a friend we’ve missed, the mug of tea we pour when we wake up to get us through a Monday morning meeting, it’s the cosy Sunday roast of the hobby world. Yes, singing together is actually good for our health, well-being and social lives. Group singing is better for your body (and wallet) than a night at the pub, more natural than medication, cheaper than therapy, and way more fun and sociable than a solitary session at the gym. It’s hard not to feel better, more positive and re-energised after a good sing. Even after a terrible day, a choir rehearsal can lift, rejuvenate and inspire. Human interaction is good for us - and when we sing together we make bonds stronger than simple acquaintance. We share so much with those around us when we sing that it is probably the fastest way to make a community. Want to feel better about the world? Surround yourself with like-minded people and three-part harmony. Most choirs are made up of people who would not have otherwise met, some of whom become life-long friends or even lovers (we’ve got our first met-in-choir wedding this year). Why? Because there’s a genuine human exchange. Smiling, familiar and supportive faces make a change from commuter rage, self service supermarket check-outs and the ever-present glare of our ubiquitous smart phones, tablets and computer screens. Singing makes us present with others and this in turn increases our well-being. Singing in a choir means making something new, finding exhilarating ways to express yourself, so the resulting pride of having made art from nothing is priceless. Creativity helps us feel connected, empowered and inspired and the sense of achievement a group gets from singing a song together is electric. When we feel out of control or stressed in other areas of our lives, singing gives us a necessary creative outlet. After a bad day, singing can help you let go of stress and tension that otherwise brews inside us. Sing a sad song and make it better, sing an up-beat number and push the bad feelings away. Singing means we can live out the worst and best in life and give our emotions a chance to have a run-around, to let go of bad feelings we’ve been hoarding and to allow the body and mind to process the stresses of modern life through the medium of song. I believe that body and mind are both treated to all the benefits of a massage while singing, which has to be a win in anyone’s books. Think of breath as the fuel that fires the body and you’ll see why breathing technique in singing is so important. As adults, we often become disconnected from our natural breathing patterns and our breath becomes strained, tense or over-worked. Singing takes us back to organic breathing patterns that release tension stored in the body, calm and relax us and make us more present, connecting us to those around us. Let’s not forget the extra muscle tone that comes with standing and breathing correctly. Win win! Singing allows us to be fun, free and young at heart, whatever else is going on in our lives. Group singing creates a natural high that leaves us buzzing for hours or even days afterwards, and gives us a chance to let of steam and be silly in a way we can’t at home or in the office. Whether it’s a silly tongue twister, a nonsense game or laughing at unintentional innuendo of the conductor’s instructions, there’s always something to keep you giggling in a fun choir setting, and this keeps us coming back for more. 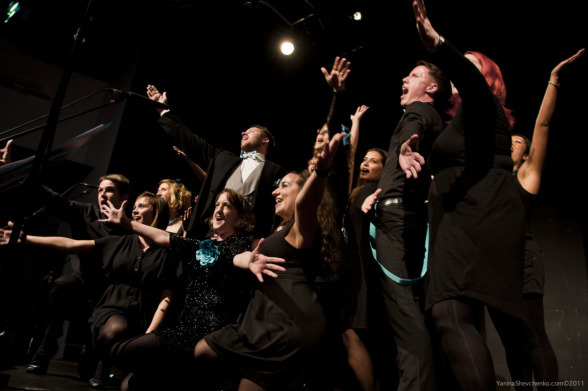 What’s your favourite thing about singing? Share it with us below or on social media!